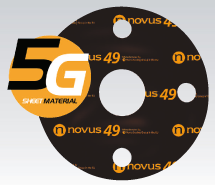 Novus 49 is a compressed sheet material which combines a high percentage of graphite, reinforced with aramid fibres and a small amount of rubber binder. High performance material with excellent mechanical properties, suitable for many applications including oils, solvents, high pressure steam and gases including oxygen. You are a very valued supplier and give us all the support and service we are looking for.